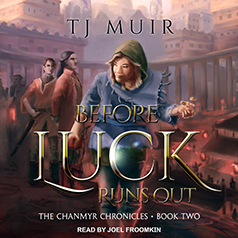 TJ Muir presents the first book in the Chanmyr Chronicles series. For fourteen years Jedda's home has been in the shadows and alleys of Tatak Rhe—city of the wealthy, powerful, and corrupt. He scrounges for survival in dirty clothes that don't keep him warm; and he relies in his nimble fingers to keep himself fed. But, buried in his blood lies the gift of magic: an invisible hand guiding his life. Cold and hungry, he nicks the coin purse of the wrong man. Karrahk is, one of the city's powerful rulers. The man looks into Jedda's green eyes, and at the tawny skin that betrays a hidden heritage. He makes a decision that will change a hungry boy's life forever. Jedda gets drawn into Karrahk's service: a man that most people fear. He learns the deepest and darkest secrets from all over the city. But when his magic awakens, everything changes. Jedda starts to see the deeper truth about this lord he has served. He is grateful to Karrahk for saving his life. But he realizes his life is in more danger from his savior than on the streets. Karrahk plays a ruthless game where power is more important than lives. What does this secretive man want, and what will Jedda have to do now if he wants to stay alive?